Ouch! My own beliefs undermined by my own historical principles! Well this is really quite embarrassing. 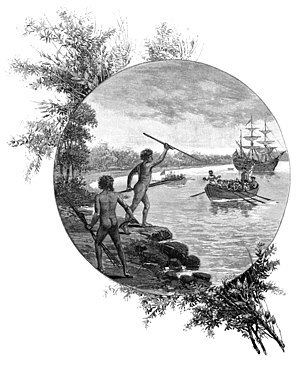 I have never read more than snippets by a notorious right wing Australian historian, Keith Windschuttle, and those I have read have been mostly quotations found in the works of his critics, but I know I have been strongly opposed to whatever Windschuttle has written about the history of the clashes between white settlers in Australia and the land’s aboriginal peoples. Politically I have long been a bit of a lefty because it is my conviction that the left is on the side of humanity. Human rights and social justice causes — including of course those of Australian aboriginals — have as a rule been very close to my heart and my energies. Historian Keith Windschuttle has long been publicly associated with that epitome of all that is opposed to anything leftish and against any idea that white Australians owe Australian aboriginals anything (least of all an apology), former Prime Minister John Howard. So what am I to do when, in expanding my knowledge of the principles historians use with respect to oral history, I discover that all for which I have been arguing vis a vis the methods of historical Jesus scholars, is on the side of my political arch-nemesis Keith Windschuttle? I have had to concede that historians who have buttressed my political views may very well have been lacking when it comes to specific details of the history of white and black relations in Australia. I am not conceding that the picture is, well, black and white (apologies for unintended pun) since the historical evidence is multifaceted and there are still details of Windschuttle’s arguments that I do question. But as far as his point about historical methodology and the use of oral history is concerned, I have to concede, ouch! that in this instance the politically right is methodologically right, too. Even my own beloved left can be wrong once or twice. This experience serves to remind me how difficult it must be for nationalistic or ethnically-oriented Jews and any Christian with religiously grounded sympathies for Israel to accept the findings of modern archaeology and the “minimalists” that question the very historical existence of biblical Israel. Not to mention how hard it clearly is for believing Christians and committed historical Jesus scholars to accept the basic norms of historiography even when quoted and placed right beneath their noses. Reading the debate about methodology is like reading a debate between myself and a historical Jesus scholar. If nothing else it reminds us that history is one of the most ideological of disciplines, and if so, surely biblical studies is the most ideological. No wonder postmodernist notions so easily white-ant both fields.